I found this great pack of animal print paper at Big Lots the other day. It has pink, purple, blue, and green, besides the black I think. (I'm not at my crafting area right now). I had been wanting to cut out this Zebra anyway so it was the perfect time! I cut all the pieces from the Paisley cart at 3 1/4 inches (I love the Expression!). I pop dotted the Zebra/Car on and added stickles to the wheel middles, flower and a little to his pink ear! And I finished it off with the pink/black polka dotted ribbon and My Pink Stamper stamp. I am the very happy owner of a Pink Expression!! I've only had the baby and was finally able to spend the money on an Expression. The plan was to wait until it went on sale, but my 11 year old daughter talked me into getting it now (she picked up the box and started walking to the register!). I did have some fun money to put towards it, so that is my excuse! But, I must get some cleaning done before I play--we have had back to back soccer tournament weekends and my house (and blog) have been very neglected. I hope to post some fun projects this week! May is such a busy month at my house. I haven't posted since National Scrapbook weekend, but I think that was at least 8 posts in two days! This card is for my daughter's birthday today. Nothing like waiting until the last minute! I picked up this cute background paper at Archiver's yesterday. In fact, all the paper came from there. They have the free cardstock coupon this month--love that one! The butterfly is from Paisley using the button feature and cut at 3 inches and pop dotted on. I stickled the middle of it. Then I doodled on that and around the Happy Birthday. I finished off the front with some blue rick rack ribbon I had in my drawer. I actually finished the inside of the card and added another butterfly I had cut out at 2 inches. I've been trying that out lately and really like the look better than a plain inside. Busy rest of the weekend with a birthday and soccer tournament here. Hope your weekend is great! I made a bunch of these M&M sleeves for all the teachers, PE, Music, Computer, etc. This is our last year at Elementary school so I thought I would do a little something for everyone. I used the button feature on Paisely for everything but the rainbow. The rainbow is from Hello Kitty Greetings. These are so simple to make and they don't cost a lot either! I would really love to win an Expression!! This is my entry for the Cuttlebug Blog's Expression Giveaway. I own the baby bug and just have not been able to buy the big one! These are for my daughter's teacher for teacher appreciation week. All the cuts are from the Paisley Cartridge. I used Design Studio to weld 2 purses on their side at 5 inches to make the gift card holder and taped just the sides together. I ran the front of this through the Cuttlebug with the Swiss Dot folder. I cut the purse on the card at 3 inches and ran that though the Cuttlebug as well as the card base. Then I cut just the apple as a topper for the M&M sleeve with the button feature. The leaf paper was also embossed with the Swiss dot folder. And of course, I used some stickles!! I hope you like my projects--thanks for taking the time to look! This challenge was to do something for Dad. I am really bad at men cards and this is no exception. I'm not that fond of this, but have no other ideas! The tropy came from Locker talk cut at 3 inches. I didn't want to add ribbon for a man card so I used the cuttlebug. But I think it needs something else, I just am better at making things cute, which would not be good for this card! This was the last challenge from Saturday. I need to go and do at least two more, not sure if I'll do all. I just don't have that much time today and have to go to work tomorrow. I think this is my last challenge for the night. I would like to think that if I was home all day, I would have kept up, but we had soccer and dinner at my parents so I'll have to finish off tomorrow--after soccer again! This was Colors of the Rainbow challenge. I was able to use all but green--just didn't have the right color green. I decided to actually make a rainbow and this is from Hello Kitty Greetings cut at 3 inches. I stickled the colors and added some self stick ribbon. Not very fancy, but kinda cute! Since I haven't been able to play along all day, I'm going out of order now! I just have ideas for some and not others, so they are easier to do. This challenge you were supposed to use a shape. I made a flower card with Design Studio. I don't have an expression so I can't go too big. But this one is 5 1/2 inches which is a decent size. I just flipped one of the flowers and welded them together at one of the petals. Oh, this came from the Paisley cart--it's the button feature from the bee cut. Then I just cut one center to the flower at the same size. I used the signo white pen to do faux stitchin around the flower. Then I stamped the smile and added yellow stickle dots to the center. Super easy (once my firmware was finally updated!)!! My daughter just told me it looked a little plain and I agreed. So I added pink gemstones to the petals. I finished this a few hours ago but had to go to my Dad's for dinner. He just didn't seem to understand that I wanted to stay home and play! This challege was to use your least favorite or used cartridge. I actually love mine and have used the all once at least. But I pulled out Tinkerbell since I haven't pulled that out in a long time. This cut was perfect for a birthday layout. The cut is a little strange, the r and i cut out apart from the rest. But it's still cute and I cut it at 3 inches. I added the cuttlebug D'vine Swirl folder but since it left weird marks, I added the ribbon to it (which would make this work for challenge 3 as well, but I didn't enter that one). Just added some white pen to the words. This made for a very fast page! 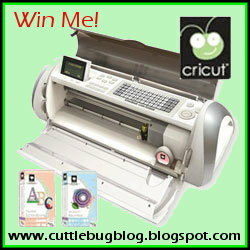 Everyday Cricut is giving away an Expression in celebration of National Scrapbook Day! If you are not a follower, you should be! Visit them here http://www.cricutholiday.com/2010/05/our-gigantic-national-scrapbook-day.html and see all the wonderful projects they share everyday! This challenge was "Getting Scrappy"-- use your scraps. Well, I pretty much do this all the time. I found all the paper in my scrap drawer--even the piece for the card. I made another Mother's Day card since I need more than one! The phrase was cut at 3 inches this time and it is still very fragile. The vine was cut at one inch. I stickled the words again and added the blue ribbon. So it's National Scrapbook Day but all I've made so far is cards--LOL! I actually made challege 2 but am waiting for stickles to dry so hopped on to #5--Teacher Appreciation. I made this card with the Paisley cartridge. The frog is cut at 3 inches. I just had this paper and had to use it since it kinda matched! The stamp is from TCP Studios. Then I used P.K. Glitz Sticky tape and their Sea Mist Glitter. Now I remembe why I use stickles--I am very sparkly now! But the colors of their glitter is so pretty. I added two adhesive gems to finish it off! My son had a soccer game this morning and we didn't get home until National Scrapbook day already started! My Pink Stamper has challenges every hour on the hour but I started with the first one. This was to make something for Mother's Day. I had been wanting to use this cut for my husband's grandmother, but hadn't yet so it was perfect timing! I used the Mother's Day cartridge and cut it and the shadow at 2 inches and pop dotted it on. The m and n were a little fragile so I definitely would not cut this any smaller. I covered it in Frosted Lace Stickles. The paper is TPC Studio and the ribbon is American Crafts. I used a Martha Stewart edge punch. I'll have some more posts today!